The Miami-Dade Transportation Quick-Build Program hit a big milestone this week with the completion of the first two selected projects! 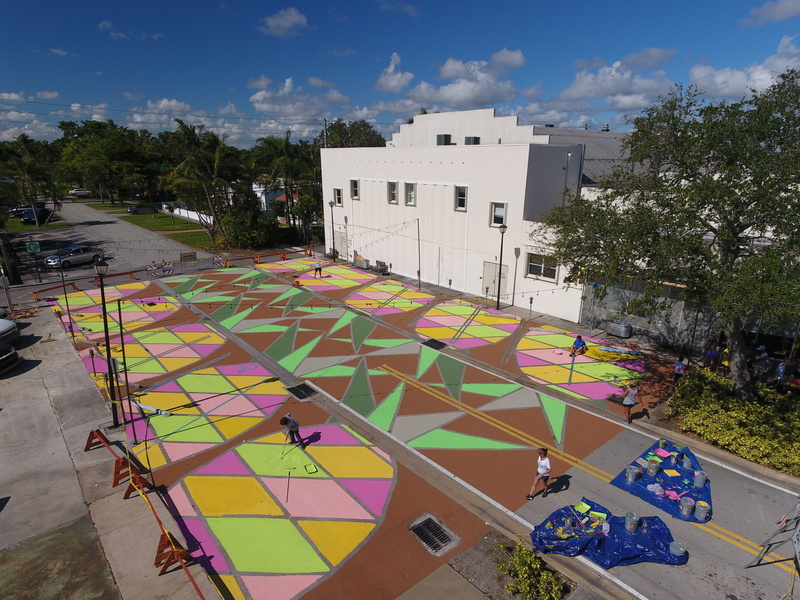 On Thursday and Friday, Street Plans, joined by DTPW, Miami Realtors, the Greater Miami Shores Chamber of Commerce, Miami Shores Village, RDA Studio, Moonlighter Makerspace, and neighbors painted an asphalt mural representative of the history of the Village– a former pineapple farm. This mural defines what is now called Plaza 98, a pedestrian plaza adjacent to the Miami Theater Center that will be the site of monthly community events on the second Friday of every month between now and the spring. The plaza held its kickoff event Saturday night with local music, food vendors, and games. On Saturday, Street Plans took to the streets with Quick-Build Program applicant William Moose to provide wayfinding for the City of Miami Little Havana Trolley riders. The signs indicate how to transfer from the trolley to adjacent routes of transit, and will serve as identifiers for the trolley stops until the city installs its permanent route signs. The signs were also supposed to be installed for the Coral Gables Trolley, but the conversation with the City of Coral Gables is ongoing. These two projects are the first of 18 selected as a part of the Quick-Build Program, an ongoing collaboration between Street Plans, DTPW, and nonprofit Green Mobility Network, dedicated to making it easier for citizens to make meaningful transportation improvements to their neighborhoods. Made possible by NYC-based foundation TransitCenter and The Miami Foundation, the Quick-Build Program provides funding for technical assistance and/or materials for the implementation of the selected projects. For more information on the Quick-Build Program, and to stay up to date with upcoming projects, visit www.quickbuild.greenmobilitynetwork.org, or follow the Program on Instagram at @mdtquickbuild. 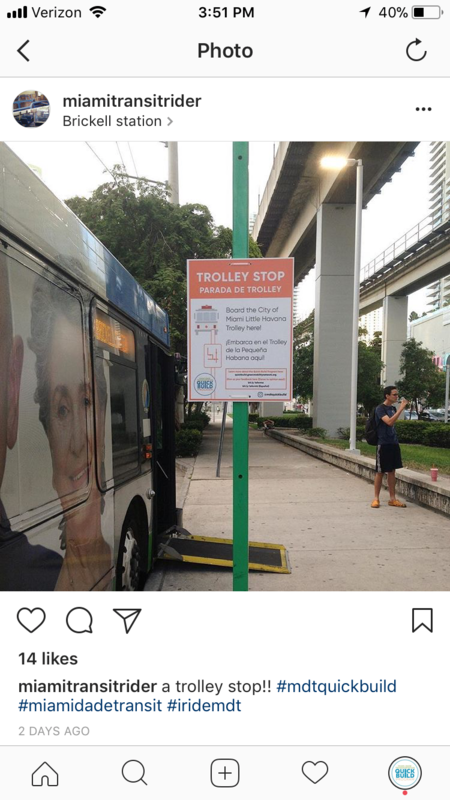 Within hours of the installation of the trolley signage, trolley riders used the Program’s hashtags to highlight the project on social media. Street Plans’ Principal Mike Lydon gave a talk to Cornell Planning Students, local planners, and government officials in Ithaca, NY last month about the Tactical Urbanism movement. The event was hosted by Cornell’s Department of City and Regional Planning. “Mike’s talk downtown really inspired folks working on the ground in Ithaca to consider using the tactical urbanism approach here,” said Thomas Knipe, Principal Planner for Tompkins County, NY. The Russell Van Nest Black Lectureship Fund and the Department of Design and Environmental Analysis cosponsored Lydon’s lecture. Click HERE to read more about his visit.